Duolingo has launched a course that should fill the hearts of geeks everywhere with glee. That’s right, folks, you can now learn to speak Klingon from the comfort of your own couch. Just go easy on the Rokeg blood pie and bloodwine while doing so. Duolingo offers a simple and effective way to learn new languages. And I can personally attest to its effectiveness. But Duolingo also has a fun side, with courses in Esperanto and High Valyrian (from Game of Thrones Everything You Want to Know About Game of Thrones Everything You Want to Know About Game of Thrones We have scoured the Web to find you the best resources about Westeros and beyond. Taken together, these contain everything you could ever want to know about Game of Thrones. Read More ). And now it has added Klingon to the mix. Klingon is one of the most well known fictional languages around. Probably ranking alongside J.R.R. Tolkien’s Elvish (from The Lord of the Rings). It was created by a linguist Marc Okrand, and true Trekkies have been learning the basics for years. Now, however, Star Trek fans have the chance to learn the language in full using Duolingo. This course has been three years in the making, with a team of volunteers fluent in the language contributing their expertise to make it happen. 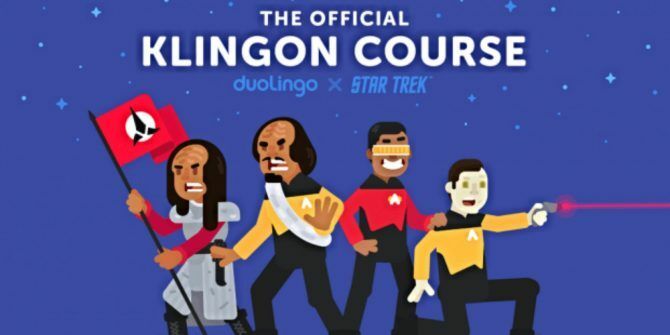 The Klingon language learning course is only available on the Duolingo website at the time of writing. However, Duolingo hopes to bring it to the Android and iOS apps in due course. In the meantime you can always work on developing your forehead ridges. To be blunt, you’re unlikely to ever visit the Klingon homeworld of Kronos, on account of it being entirely fictional. However, you could jump on a plane to Spain or Italy, so it would make much more sense to learn Spanish or Italian. Still, as difficult as Klingon looks, it’s easier than Japanese, which Duolingo also recently added to its lineup Duolingo Now Helps You Learn Japanese Duolingo Now Helps You Learn Japanese Duolingo has been helping people learn languages since 2011. However, it doesn't yet offer courses in every language, including Japanese. Until now... Read More . So if you’re a passionate Trekkie and want to converse with other geeks at conventions maybe there’s some value in learning Klingon. Qapla’! Explore more about: Duolingo, Language Learning, Star Trek. How do you write an article like this without including Nvidia ShieldTV? You asked which is the best but you left it out.